One of the most important tax forms you will receive is a W2. The W2 Form which employers use to report employee wages, bonuses and other benefits received during the year; along with taxes (federal, state, medicare and social) that were withheld. It also shows voluntary pre and post tax contributions made to your 401K and company health programs. W2 Changes in 2011 – The W2 form for 2011 is pretty much the same as 2010 expect that employers now have to report the cost of tax-free medical coverage under an employer-sponsored group health plan (this is optional for employers in 2011, but you may still see it). The reporting of this cost, mandated under the Obama’s health care plan, is intended to provide employees with greater transparency into their overall health care costs. When will you receive your W2: Employers are required by law to provide (via mail or hand-delivered) a form W-2 by the end of January (see latest tax year schedule). If you have not received your W-2 shortly after this date contact your employer’s payroll department to obtain a re-issued copy. Multiple W2s: You should get a W2 (original and copy) from any employer you worked for where income, social security, or Medicare tax was withheld. There are no minimum income limits for an employer to file a W2. Electronic W2s : These are now being sent electronically by some employers, but you still need to give your consent. These can be automatically loaded into popular tax packages like Turbo Tax and H&R Block. Common Errors to check for: While most employers not use electronic software or outsource payroll tax services, you must check your name’s spelling and reported dollar amounts are correct. To check your dollar amounts, look at your last pay check for the year, which should have year-to-date (YTD) amounts. These should match up to what’s reported in your W2. If you cannot reconcile the numbers between your paycheck(s) and your W2, make sure you call your payroll department well before April 15, so that any errors can be fixed in time. After all you don’t want to get audited for a data error your employer made. Earned income credit (EIC) notice. Employers use the W2 to notify employees who have no income tax withheld that they may be able to claim an income tax refund because of the EIC. See this post for special payments and rules for 2010 Earned Income Credits. Box a – Employee’s Social Security Number: This is your Social Security number as provided to your Employer. This number should be an exact match to the number appearing on your Social Security card. Box c – Employer’s Name, Address, and Zip Code: This is your Employer Payroll Department’s U.S. mail address for W-2 purposes. Box e and f – Employee’s Name, Address, and Zip Code: This is your name and last address on file as it appears on your Employer’s current payroll records. The name should be an exact match to the name appearing on your Social Security Card. Making sure your employer has your latest address is especially important if you are getting your W2 mailed out. Box 1 – Wages, Tips, Other Compensation: This amount includes total wages, tips and other compensation paid to you during the calendar year based on dollars received from the first pay day in January to the last pay day in December. In addition, any amounts received as fringe benefits – for example, the value of group-term life insurance plan coverage in excess of $50,000 – are also added to the wages in Box 1. However, salary reductions for health and dental insurance plan coverage, flexible spending account for health, flexible spending account for dependent care benefits up to $5000, and contributions to a retirement plan, will reduce the income reported in this box. Box 2 – Federal Income Tax Withheld: This is the amount of federal income tax withheld from your wages reported in Box 1. Your W-4 Employee Withholding Allowance Certificate (you normally file this with your payroll group) is used to determine the rate which tax was withheld. 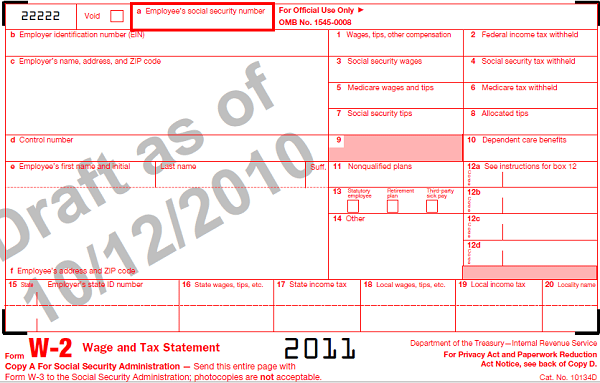 Box 3 – Social Security Wages: This amount represents total wages, tips and other compensation plus imputed income minus salary reductions for health insurance plan coverage and spending accounts up to the maximum Social Security wage base for each year that was subject to Social Security tax. Therefore, this box may differ from Federal (Box 1) wages in that salary reductions for retirement plan contributions do not reduce the wages reported in Boxes 3 and 5. Box 4 – Social Security Tax Withheld: This amount represents 6.20% of the total Social Security tax that was withheld from Social Security wages during the year. Box 5 – Medicare Wages (HI): The wages and tips subject to Medicare tax are the same as those subject to Social Security tax (Box 3), except that there is no income base limit for Medicare tax. Box 6 – Medicare Tax Withheld (HI): This amount represents 1.45% of the total Social Security tax that was withheld from Medicare wages during the year. Box 9 – Advance EIC Payment: This amount represents the total paid to you as advance earned income credit payment based on the Form W5 Earned Income Credit Advance Payment Certificate you filed with your Employer. Note: The total includes any amount in excess of the $5,000 exclusion. The excess amount over $5,000 is included in wages reported in Boxes 1, 3, and 5. C – This is the taxable amount of the cost of group-term life insurance coverage over $50,000. The amount is also included in Boxes 1, 3, and 5. D – This is the amount deferred into a 401(k), Federal Thrift Savings Plan. You are not required to pay federal or state income tax on the money contributed to this plan; however, the amounts deferred are subject to Social Security and Medicare taxes. The amount deferred is not included in Box 1. E – This is the amount deferred into a section 403(b) salary reduction agreement. You are is not required to pay federal or state income tax on the money contributed to the plan; however, the amounts deferred are subject to Social Security and Medicare taxes. The amount deferred is not included in Box 1. G – This is the amount of elective and non-elective contributions to a section 457(b) deferred compensation plan for employees of a state organization. You are is not required to pay federal or state income tax on the money contributed to the plan; however, the amounts deferred are subject to Social Security and Medicare taxes. The amount deferred is not included in Box 1. P – This amount includes payments made by an employer for qualified moving expenses and excluded from income. The amount in this Box is not included in Boxes 1, 3, or 5 of the Form W-2. Box 13 – Retirement Plan: will be checked if an employee was an active participant in a retirement plan for any part of the year. If the “Retirement plan” box is checked, special limits may apply to the amount of IRA contributions the employee may deduct. Box 15 – Name of State: This is the name of the state that issued the Form W-2 and your Employer’s state identification number. Box 16 – State Wages, Tips, Etc. : The amount in this Box includes wages, tips and other compensation for the year. Box 17 – State Income Tax Withheld: This is the total state income tax that was withheld from wages, tips and other compensation for the calendar year. What is “The Obama’s health care plan?” I was under the impression that Congress formulated the plan and passed it into law. I didn’t realize the “the Obamas” (the president and his wife and kids?) did that. Your political bias is showing. Be accurate.